South America is a continent of the Americas, situated entirely in the western hemisphere and mostly in the southern hemisphere. It is bordered on the west by the Pacific Ocean and on the north and east by the Atlantic Ocean. North America and the Caribbean Sea lie to the northwest. The continent was named in 1507 by cartographs Martin Waldseemüller and Matthias Ringmann after Amerigo Vespucci, who was the first European to suggest that the Americas were not the East Indies, but a New World unknown to Europeans. South America has a land area of 17,840,000 square kilometers (6,890,000 sq mi), or almost 3.5 percent of the Earth's surface. South America ranks fourth in area (after Asia, Africa, and North America) and fifth in population (after Asia, Africa, Europe, and North America). It is a continent of incredible biodiversity, home to the great Amazon River and rainforest as well as to the Pantanal wetland system. It also has the world's highest waterfall (Angel Falls), longest mountain range (the Andes), and driest desert (the Atacama). South America comprises the major southern portion of the landmass generally referred to as the Western Hemisphere or the Americas. It is south and east of the Panama Canal, which transects the Isthmus of Panama. Geologically, almost all of mainland South America sits on the South American Plate. Geopolitically, all of Panama—including the segment east of the Panama Canal in the isthmus—is often considered a part of North America alone and among the countries of Central America, not South America. Geologically, the continent became attached to North America only recently with the formation of the Isthmus of Panama approximately 3 million years ago, which resulted in the Great American Interchange. The Andes, likewise a comparatively young and seismically restless mountain range, run down the western edge of the continent; the land to the east of the Andes is largely tropical rainforest, the vast Amazon River basin. 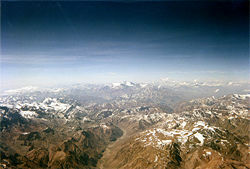 The continent also contains drier regions such as East Patagonia and the extremely arid Atacama Desert. The South American continent also includes various islands, many of which belong to countries on the continent. Many of the islands of the Caribbean (or West Indies)—for example the Lesser Antilles—sit atop the Caribbean Plate, a tectonic plate with a diffuse topography. The islands of Aruba, Barbados, Trinidad and Tobago sit on the northerly South American continental shelf. The Netherlands Antilles and the federal dependencies of Venezuela lie along the northerly South American. Geopolitically, the island states and overseas territories of the Caribbean are generally grouped as a part or subregion of North America. The South American nations that border the Caribbean Sea—including Colombia, Venezuela, Guyana, Suriname, and French Guiana—are also known as Caribbean South America. Other islands are the Galápagos, Easter Island (in Oceania but belongs to Chile), Robinson Crusoe Island, Chiloé Island, Tierra del Fuego and the Falkland Islands. and the world's southernmost town, Puerto Toro, Chile. South America's major natural resources are gold, silver, copper, iron ore, tin, and oil. The many resources of South America have brought high income to its countries especially in times of war or of rapid economic growth by industrialized countries elsewhere. However, the concentration in producing one major export commodity often has hindered the development of diversified economies. The inevitable fluctuation in the price of commodities in the international markets has led historically to major highs and lows in the economies of South American states, often also causing extreme political instability. This is leading to efforts to diversify their production to drive them away from remaining as economies dedicated to one major export. South America is home to many interesting and unique species of animals including the llama, anaconda, piranha, jaguar, vicuña, and tapir. 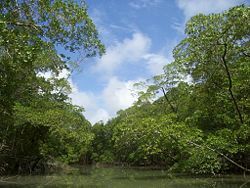 The Amazon rainforests possess high biodiversity, containing a major proportion of the Earth's species. Among people in some English-speaking countries, there is a tendency to confuse the linguistic and geographic divisions of the Americas: thus, Mexico, some Central American and Caribbean territories, despite their location in North America, are mistakenly included in South America. 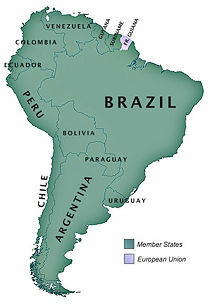 The term Latin America is used when referring to those territories whose official or national languages come from Latin (namely Portuguese, Spanish, and French). Conversely, Anglo-America is used to refer to areas whose major languages are Germanic (namely English) such as Guyana, Suriname, Belize, Jamaica, and much of the West Indies. Similarly, areas where English is prominent are considered part of the Anglosphere. 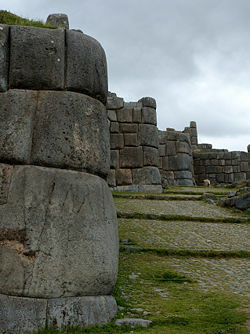 The Inca stronghold of Sacsayhuamán. 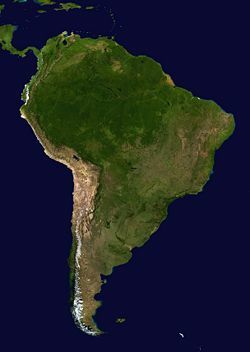 South America is thought to have been first inhabited by people crossing the Bering Land Bridge, which is now the Bering Strait. Some archaeological finds do not fit this theory, and have led to an alternative theory, Pre-Siberian American Aborigines. The first evidence for the existence of agricultural practices in South America date back to circa 6500 B.C.E., when potatoes, chillies and beans began to be cultivated for food in the highlands of the Amazon Basin. Pottery evidence further suggests that manioc, which remains a staple foodstuff today, was being cultivated as early as 2000 B.C.E..
By 2000 B.C.E. many agrarian village communities had been settled throughout the Andes and the surrounding regions. Fishing became a widespread practice along the coast which helped to establish fish as a primary source of food. Irrigation systems were also developed at this time, which aided in the rise of an agrarian society. 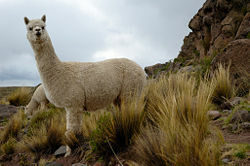 South American cultures began domesticating llamass, vicuñas, guanacoss, and alpacas in the highlands of the Andes circa 3500 B.C.E. Besides their use as sources of meat and wool, these animals were used for transportation of goods. The rise of agriculture and the subsequent appearance of permanent human settlements allowed for the multiple and overlapping beginnings of civilizations in South America. The earliest known South American civilization was at Norte Chico, on the central Peruvian coast. Though a pre-ceramic culture, the monumental architecture of Norte Chico is contemporaneous with the pyramids of Ancient Egypt. The Chavín established a trade network and developed agriculture by 900 B.C.E., according to some estimates and archaeological finds. Artifacts were found at a site called Chavín de Huantar in modern Peru at an elevation of 3,177 meters. Chavín civilization spanned 900 B.C.E. to 300 B.C.E..
From their capital city of Cusco, the Inca civilization dominated the Andes region from 1438 to 1533. Known as Tawantinsuyu, or "the land of the four regions," in Quechua, the Inca culture was highly distinct and developed. Cities were built with precise, unmatched stonework, constructed over many levels of mountain terrain. Terrace farming was a useful form of agriculture. There is evidence of excellent metalwork in Inca civilization. Nevertheless, the Inca never discovered the wheel, and there is no evidence that they utilized written language, although they did use the quipu for record-keeping and communication. Other important Pre-Columbian cultures include: Valdivia (Ecuador), Moche (100 B.C.E. - 700 C.E., at the northern coast of Peru); Tiuahuanaco or Tiwanaku (100 B.C.E. - 1200 B.C.E., Bolivia); Paracas - Nazca (400 B.C.E. - 800 C.E., Peru); Wari or Huari Empire (600 C.E. - 1200 C.E., Central and northern Peru); Chimu Empire (1300 C.E. - 1470 C.E., Peruvian northern coast); Chachapoyas; and the Aymaran kingdoms (1000 C.E.- 1450 C.E., Bolivia and southern Peru). In 1494, Portugal and Spain, the two great maritime powers of that time, on the expectation of new lands being discovered in the west, signed the Treaty of Tordesillas, by which they agreed that all the land outside Europe should be an exclusive duopoly between the two countries. The Treaty established an imaginary line along a north-south meridian 370 leagues west of Cape Verde Islands, roughly 46° 37' W. In terms of the treaty, all land to the west of the line (which is now known to comprehend most of the South American soil), would belong to Spain, and all land to the east, to Portugal. As accurate measurements of longitude were impossible at that time, the line was not strictly enforced, resulting in a Portuguese expansion of Brazil across the meridian. European infectious diseases (smallpox, influenza, measles, and typhus) to which the native populations had no immune resistance, and systems of forced labor, such as the haciendas and mining industry's mita, decimated the native population under Spanish control. After this, African slaves, who had developed immunities to these diseases, were quickly brought in to replace them. The Spaniards were committed to converting their native subjects to Christianity, and were quick to purge any native cultural practices that hindered this end. However, most initial attempts at this were only partially successful, as native groups simply blended Catholicism with traditional idolatry and their polytheistic beliefs. Furthermore, the Spaniards did impose their language to the degree they did their religion, although the Roman Catholic Church's evangelizing in Quechua, Aymara and Guaraní actually contributed to the continuous use of these native languages albeit only in the oral form. Eventually the natives and the Spaniards interbred, forming a mestizo class. 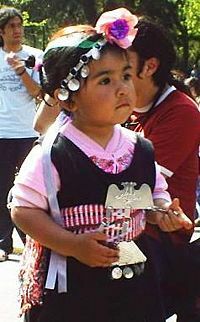 Essentially all of the mestizos of the Andean region were offspring of an Amerindian mothers and Spanish fathers. Mestizos and the Indian natives were often forced to pay extraordinary taxes to the Spanish government and were punished harshly for disobeying their laws. Many native artworks were considered pagan idols and destroyed by Spanish explorers. This included the many gold and silver sculptures and artifacts found in South America, which were melted down before their transport to Spain or Portugal. A few countries did not gain independence until the twentieth century. Guyana, from the United Kingdom in 1966 and Suriname, from Dutch control in 1975. French Guiana remains part of France as of 2007, and hosts the European Space Agency's principal spaceport, the Guiana Space Center. The continent, like many others, became a battlefield of the Cold War in the late twentieth century. Some governments of Argentina, Brazil, Chile, and Uruguay were overthrown or displaced by United States-aligned military dictatorships in the 1960s and 1970s. To curtail opposition, their governments detained tens of thousands of political prisoners, many of whom were tortured and/or killed (on inter-state collaboration). Economically, they began a transition to neoliberal economic policies. They placed their own actions within the U.S. Cold War doctrine of "National Security" against internal subversion. Throughout the 1980s and 1990s, Peru suffered from an internal conflict (Túpac Amaru Revolutionary Movement and Shining Path). Revolutionary movements and right-wing military dictatorships have been common, but starting in the 1980s a wave of democratization came through the continent, and democratic rule is now widespread. Nonetheless, allegations of corruption remain common, and several nations have developed crises which forced the resignation of their presidents, although in general, normal civilian succession has continued. International indebtedness became a notable problem, as most recently illustrated by Argentina's default in the early twenty-first century. In the first decade of the twenty-first century, South American governments have drifted to the political left, with socialist leaders being elected in Chile, Bolivia, Brazil, Venezuela, and leftist presidents in Argentina, Ecuador, Peru, and Uruguay. Despite the tendency to move to the left of the political spectrum, most of South America's governments are in practical terms societies embracing free-market capitalism. With the founding of the Union of South American Nations, South America will intend to start down the road of economic, social and political integration, with plans for European Union-style integration in the non-distant future. The countries in this table are categorized according to the scheme for geographic regions and subregions used by the United Nations, and data included are per sources in cross-referenced articles. Where they differ, provisos are clearly indicated. Buenos Aires is the biggest city in Argentina and the second in the continent. Bogotá, in Colombia, the third largest city in South America. Due to histories of high inflation in nearly all South American countries interest-rates remain high, and thus investment remains low. Interest rates are usually twice that of the United States. The exception is Chile, which has been successfully implementing free market economic policies since the 1980s and increased its social spending since the return of democratic rule in the early 1990s. This has led to economic stability and interest rates in the low single digits. The Union of South American Nations is a planned continent-wide free trade zone to unite two existing free-trade organizations—Mercosur and the Andean Community. The economic gap between the rich and poor in most South American nations is considered to be larger than in most other continents. In Venezuela, Paraguay, Bolivia and many other South American countries, the richest 20 percent may own over 60 percent of the nation's wealth, while the poorest 20 percent may own less than 5 percent. This wide gap can be seen in many large South American cities where makeshift shacks and slums lie next to skyscrapers and upper-class luxury apartments. Spanish is the most widespread language of the continent, as Spanish is the official language of most South American nations. However, the majority of South Americans (51 percent) speak Portuguese, the official language of Brazil. Dutch is the official language of Suriname; English the official language of Guyana; and French the official language of French Guiana. Just a few of the many indigenous languages of South America include: Quechua (in Bolivia, Peru, and Ecuador); Aymara (Bolivia, Chile and Peru); Guaraní (in Paraguay and Bolivia); and Mapudungun (Chile and certain pockets of Argentina). Other languages to be found in South America include: Hindi and Indonesian in Suriname; Italian in Argentina, Brazil, Uruguay, Venezuela and Colombia; German in certain pockets in Brazil, Argentina, Chile, Venezuela, Colombia and Paraguay; Welsh remains spoken and written in the historic towns of Trelew and Rawson in Patagonia, Argentina; small cluster groups of Japanese speakers in Brazil, Bolivia, Colombia, Peru and Ecuador; Arabic speakers, often of Lebanese and Syrian descent, in Arab communities of Chile, Brazil and Argentina. In some countries the continent's upper classes and well-educated people study English and French, and in areas with much tourist commerce English is readily spoken. There are also small Spanish speaking areas of Southernmost Brazil, due to the proximity to Uruguay. 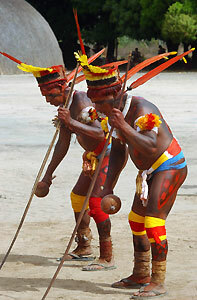 Kuarup ritual ceremony by Xavante Indians in the Xingu River region, Brazil. South Americans are culturally enriched by the historic connection with Europe, especially Spain, and the impact of mass culture from the United States of America. South American nations have a rich variety of music. Some of the most famous genres include cumbia from Colombia, samba and bossa nova from Brazil, and tango from Argentina and Uruguay. Also well known is the non-commercial folk genre Nueva Canción movement which was founded in Argentina and Chile and quickly spread to the rest of the Latin America. People on the Peruvian coast created the fine guitar and cajon duos or trios in the most mestizo (mixed) of South American rhythms such as the Zamacueca (from Lima), the Tondero (from Piura), the nineteenth century popular Creole Valse or Peruvian Valse and the soulful Arequipan Yaravi. In the late twentieth century, Rock en español emerged by young hipsters influenced by British pop and American rock in Argentina, Chile and Uruguay. Brazil has a Portuguese-language pop rock industry as well a great variety of other music genres. The literature of South America has attracted considerable critical and popular acclaim, especially with the Latin American Boom of the 1960s and 1970s, and the rise of authors such as Gabriel García Márquez and Mario Vargas Llosa. Because of South America's broad ethnic mix, South American cuisine takes on African, American Indian, Asian and European influences. The cuisine of Argentina for example is distinctive in South America because of its strong resemblance to Italian, Spanish, French and other European cuisines rather than the other Latin American cuisines. The cuisine of Brazil, like Brazil itself, varies greatly by region. This diversity reflects the country's mix of native Amerindians, Portuguese, Africans, Italians, Spaniards, Germans, Syrians, Lebanese, and Japanese among others. This has created a national cooking style marked by the preservation of regional differences. Many of the other South American nations have similar varied cuisines influenced by region. Rice and beans is an extremely popular dish, considered a basic staple in many South American countries. Argentineans, Chileans, and Uruguayans regularly consume wine, while Argentina along with Paraguay, Uruguay and people in southern Chile and Brazil enjoy a sip of Mate, a regional brewed herb cultivated for its drink. Pisco is a liquor distilled from grapevine produced in Peru and Chile, however, there is a recurring dispute between those countries regarding its origins. Peruvian cuisine mixes elements from both Chinese, Japanese, Spanish, Inca, and Amazonic food. Roman Catholicism is the dominant religion of the region as a whole; however Protestantism is growing steadily. Guyana and Suriname have significant Hindu, and Muslim communities. Jewish communities are found across South America; the largest are in São Paulo, Brazil and Buenos Aires, Argentina. There is also a significant community in Montevideo, Uruguay. There are significant numbers of Eastern Orthodox churches founded by immigrants from the Middle East. Descendants of Indigenous peoples, such as the Quechua and Aymara, make up the majority of the population in Peru and Bolivia, and are a significant element in most other former Spanish colonies. Exceptions to this include Argentina and Uruguay. At least three South American indigenous languages (Quechua in Peru and Bolivia, Aymara also in Bolivia, and Guarani in Paraguay) are recognized along with Spanish as national languages. ↑ 1.0 1.1 1.2 Patrick Karl O'Brien, Atlas of World History (New York, NY: Oxford University Press, 2002, ISBN 0195215672). (French) Information about South American Music.